According to Premium Times, a fire outbreak on Sunday completely burnt down the Independent National Electoral Commission office in Qua’an Pan Local Government Area of Plateau. Osaretin Imajiyereobo, Head of Department Voter Education and Publicity in Plateau State, confirmed the fire in a statement. 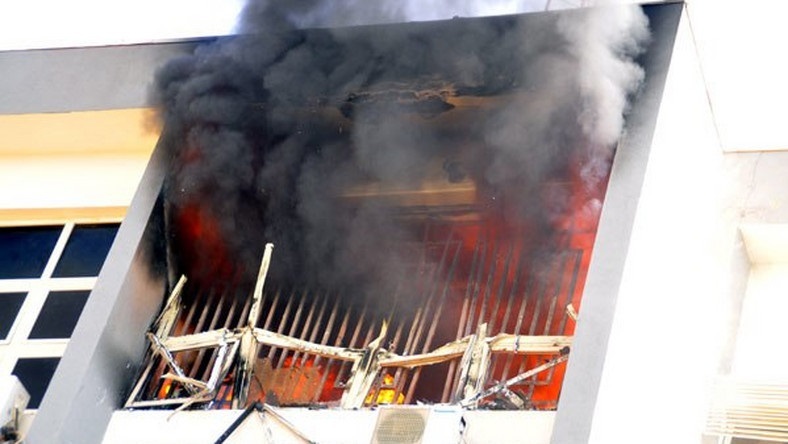 Imajiyereobo said election materials such as ballot boxes, PVCs, and voters registers were among the things burnt down. President Buhari and Atiku Abubakar, presidential candidates of the APC and PDP will meet with former president of America Bill Clinton and Secretary-General of the Commonwealth, Baroness Patricia Scotland, to sign the National Peace Accord. The event is scheduled to hold on Wednesday at the International Conference Centre in Abuja. The Peoples Democratic Party, PDP, on Sunday took a swipe at President Buhari, saying that his administration has no moral rectitude to pontificate on corruption. This was revealed in a statement in by the National Publicity Secretary and Director, Media and Publicity, PDP Presidential Campaign Organization, Kola Ologbondiyan. The acting Inspector-General of Police, Mohammed Adamu, has ordered a comprehensive and water-tight security around all Independent National Electoral Commission offices and facilities nationwide. The Force spokesman, Frank Mba, said in a statement in Abuja on Sunday, that Zonal Assistant Inspectors-General of Police have also been mandated to monitor the compliance level of the commands under their jurisdiction to the directive. No fewer than three people have been feared dead and over 30 others fainted waiting for the campaign team of the Peoples Democratic People (PDP) presidential candidate Atiku Abubakar at Sani Abacha Stadium, Kano on Sunday. Unconfirmed reports have it that the alleged death of the three people was as a result of a bloody clash between rival groups of the PDP outside the stadium.